"An Ebola virus outbreak has killed 11 people in western Congo, the health minister said. A total of 35 people have been infected in Kaluemba, Western Kasai province, where the epidemic began in late November, Health Minister August Mopipi said. Suspected cases of the highly contagious disease have also been identified in neighboring villages, Mopopi said. 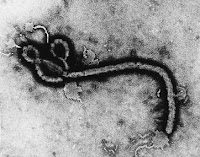 Laboratory tests in both Gabon and Congo's National Institute for Biomedical Research confirmed Ebola in the 11 deaths, he said. The World Health Organization has confirmed only two Ebola cases, however, and said other diseases were likely involved. Ebola kills up to 90 percent of the people it infects and is spread through direct contact with the blood or secretions of an infected person or with contaminated objects. The disease can lie dormant for up to three weeks before flu-like symptoms set in. 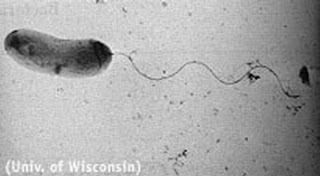 It then starts attacking internal organs, causing bloody diarrhea and vomiting and death from massive blood loss. Last year, Ebola killed at least 187 people in the same region of Congo. Area villagers have recently been reported diarrhea and vomiting of blood, said Olivier Chenebon of the Belgian charity Doctors Without Borders." If the past is any indication of how things will turn out in the present, we will likely see the death toll of this outbreak rise considerably. "SOUTH AFRICA: Eight deaths and around 500 cases have been reported, most of them Zimbabweans crossing the border to seek treatment. The South African town of Musina is just over the frontier from Beitbridge, the second worst affected area in Zimbabwe. Army medics are being sent to reinforce a treatment centre in Musina and environmental health officers are going to towns near the frontier. South Africa is also trying to protect itself by sending some £30,000 of medical supplies, including chlorine tablets and body bags, to keep Zimbabwe's shattered public hospitals open. South African experts are in Beitbridge trying to repair its collapsing water system and supply residents by tanker. Rivers along the border are being screened for cholera after the Limpopo was found to be contaminated. MOZAMBIQUE: One of Zimbabwe's worst affected districts is Mudzi, on the country's eastern border with Mozambique. That country's health authorities are on "maximum alert" against the spread of cholera, said Ivo Garrido, the health minister. Specialists have been sent to the border areas, with one newspaper reporting 169 cases of cholera in Changara district, most of them Zimbabweans. None has died. ZAMBIA: Zimbabwe's northern neighbour has imposed health controls at all three of their shared border posts. One Zimbabwean has died at a cholera centre at the Chirundu crossing. There is a ban on importing uncertified food and anyone entering or leaving Zambia is screened for cholera symptoms. Mwendoi Akakandelwa, the deputy health minister, said Zambia was on high alert but he ruled out closing the border. 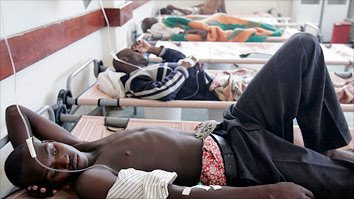 BOTSWANA: At least one Zimbabwean has been treated for cholera in Botswana. Teams have been sent to the border town of Matsiloje, where illegal immigrants live in crowded conditions, to investigate possible infections. The government says it has sufficient medical supplies." "AS ROBERT Mugabe's Zimbabwe government swallowed its pride and asked for international help to contain a cholera epidemic it had insisted a few days earlier was under control, body bags were among the items it requested. Zimbabweans are dying in their hundreds from a disease which, in the 21st century, should not be a mass killer. Some are dying as they reach Zimbabwe's major hospitals, only to find them closed because they have no drugs, running water or working equipment. It is in these institutions that the United Nations and the World Health Organisation (WHO) count the dead, arriving at an official death toll of 575. But the real number of dead is many times greater. The UN and WHO are unable to count those who die in their own homes in the urban townships or in the huts and fields of the rural areas. WHO says that the normal fatality rate in a modern cholera outbreak, where clean water and medication are available, is below 1%. But the death rate among infected Zimbabweans is at least 4.5% and as high as 30% in remote areas, WHO said."